Learn the secrets behind one of the most famous Italian sauces in the world, and make a delicious Homemade Pesto Sauce in less than 10 mins. 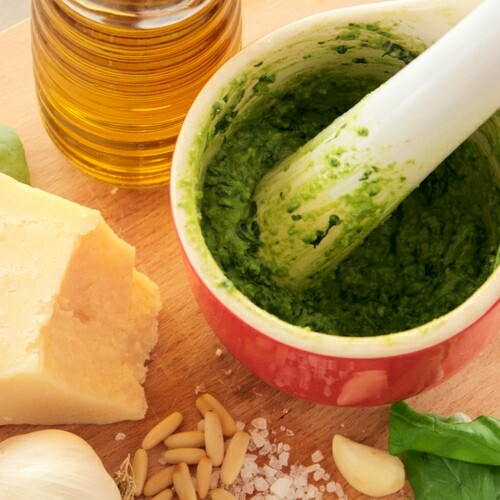 Pesto is a traditional sauce originating from Genoa, and literally means “crushed”, in reference to the original method of preparation, using a pestle and mortar. If you don’t have a mortar at home, you can obviously use a food processor to make pesto, but make sure the blazes are very cold and you only pulse for few seconds, to maintain its beautiful bright green color. Pesto is a fantastic quick fixing if you’re looking for an easy vegetarian sauce to go with your pasta. If you’re a meat lover, it’s also a great accompaniment for salmon, steak, carpaccio, to name a few. 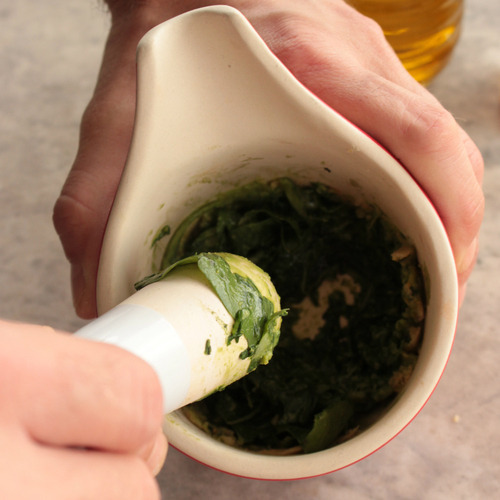 Making pesto couldn’t be easier, the secret behind this amazing sauce is sourcing well the few ingredients you need to make it. Pick the best and freshest available on the market and you’re ready to go. 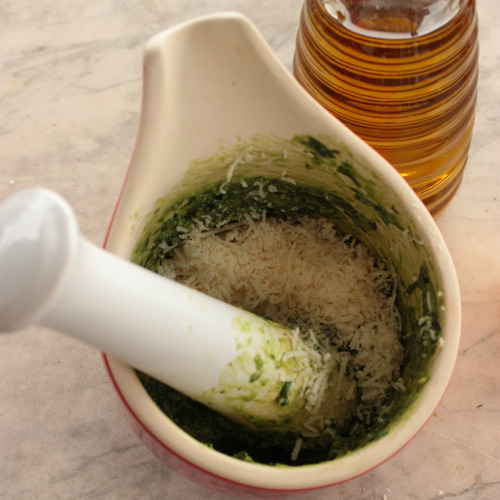 Start by trying the classic pesto, once you’ve mastered the basic recipe, get creative and add different nuts, cheeses and even herbs! 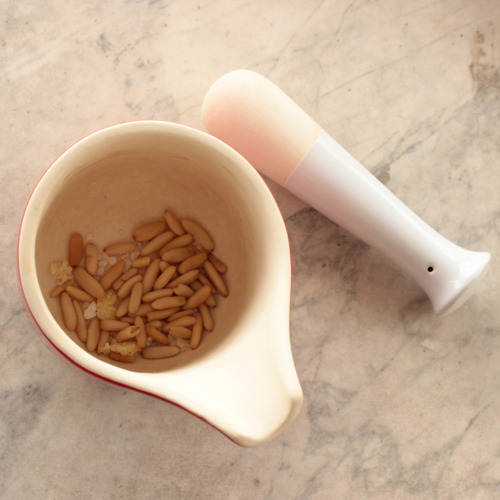 Place pine nuts, garlic and salt into the mortar and crush until reaching a paste consistency. 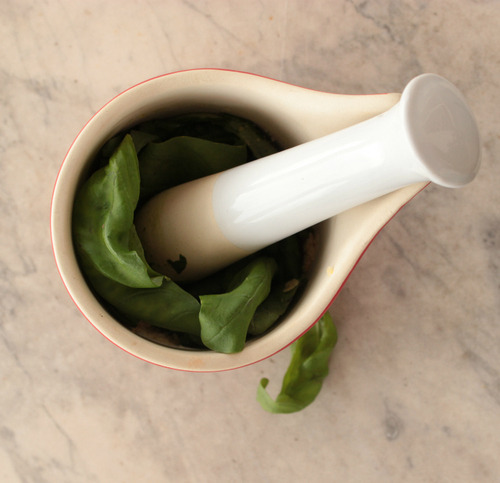 Gradually add in the basil leaves, crushing with the pestle all the way long. 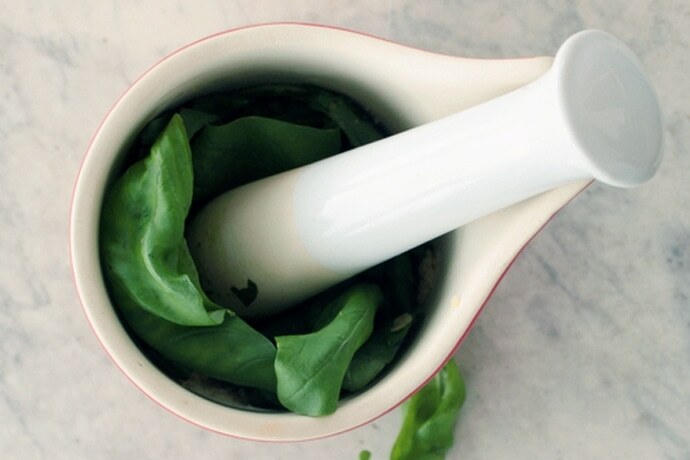 Pestle until all the leaves turn into a creamy bright green paste. Fold in the Parmesan cheese and mix until well combined. 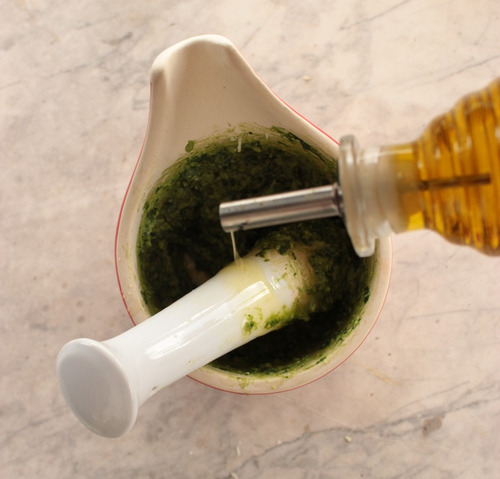 Gradually add in the extravirgin olive oil, until reaching a creamy texture. Here we go, pesto is done! For the best pasta with pesto you will ever taste, mix the pesto sauce with 1/3 cup of pasta cooking water, toss into the pasta and serve. Check out these tasty pesto variations to make a different sauce for every day of the week! Gradually add in the extravirgin olive oil, until reaching a creamy texture. Reserve ⅓ cup pasta cooking water and mix with pesto before tossing it with the pasta. Refrigerate in airtight container for up to 3 days. yummy, this recipe tasted perfect. Great recipe. Thanks for sharing. So happy you liked it Simon 🙂 Do give a try to this awesome arugula pesto too!